Browse: Home / xrdp is a tool for the X11 protocol exploiting unauthenticated x11 sessions. 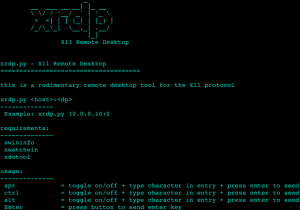 xrdp is to automate the process of using the default X toolset into an easy to use tool for exploiting unauthenticated X11 access. Our tool provides a streamlined method for connecting to an X server in order to send commands and receive output hijacking the remote host. The provided user interface is designed to resemble a remote desktop connection apart from the added user input fields. Before using the tool, a vulnerable host will need to be found using available scanners or using the Nmap script we developed to find vulnerable hosts with currently active displays that can be hijacked. 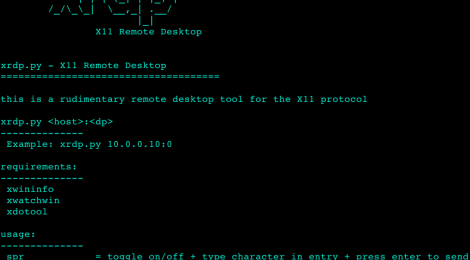 xrdp – X11 Remote Desktop. ← WiFi-autopwner – script to automate searching and auditing Wi-Fi networks with weak security.